Ford Expands F-150 Truck Recall Over Air Bag Defects : The Two-Way Ford is widening an earlier recall of its F-150 pickup trucks to about 1.2 million vehicles. This photo provided by the Ford Motor Co. shows the 2011 Ford F-150 truck. 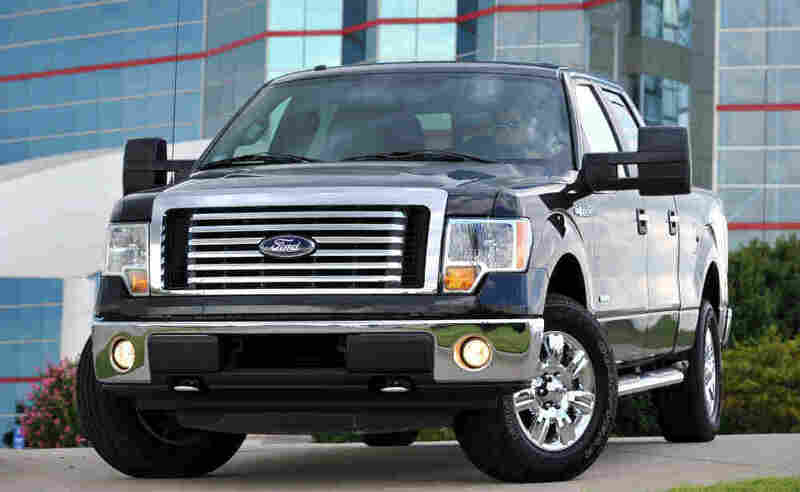 Ford is widening an earlier recall of its F-150 pickup trucks to about 1.2 million vehicles. The Transportation Department says it has 269 reports of airbags suddenly deploying in the vehicles produced in the 2004-2006 model years. The Detroit News reports the automaker resisted, but faced growing pressure from the National Highway Traffic Safety Administration. NHTSA said over the last 27 years, it has opened 33 investigations into sudden air-bag deployment — and said 269 air-bag deployments "represented the most incidents ever recorded in any inadvertent air-bag deployment investigation or recall in NHTSA history." NHTSA argues the Ford failure rate is 20 incidents per 100,000 vehicles, while Ford calculates it at 5.3 per 100,000. Earlier this year, Ford agreed to fix airbags in about 150,000 affected trucks, according to AP, saying it doesn't have any reports of crashes caused by the problem. But NHTSA pushed for more, saying it had reports of 98 injuries, including from some people who were seriously hurt. Ford changed its position after the federal agency warned it would push for public hearings on the matter.